I got sent this lovely card from Montana, where huckleberries grow wild on mountain slopes. Apparently the fruit is never grown commercially, so if you want to taste this sweet treat you have to go pick them by hand. Here’s the thing though, and this is one of the reasons I love the card, in it’s description of huckleberries on the back, it says ‘many animals depend on this source of food, including bears, so beware of bears while picking’!!! Okaaaaay, so who’s for blueberry pie instead? 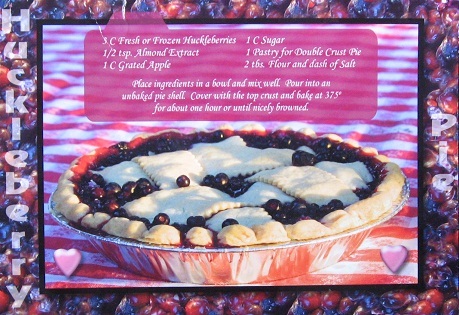 Anyway, here’s the recipe as it appears on the card, and I’m sure blueberries or cherries would taste pretty good in it too! Place ingredients in a bowl and mix well. Pour into an unbaked pie shell. Cover with the top crust and bake at 375˚ for about one hour or until nicely browned. The Royal Horticultural Society has declared this the first National Gardening Week! Of course, it’s a fitting time for it as the garden is springing into life and there’s a lot of work to be done out there. I’m badly behind, although there have been one or two results for our efforts round here, including all of our sweetcorn plants sprounting strongly and 4 broad bean plants have so far shown their heads! This year though, for some reason, the rhubarb is already proving to be a star trooper, with some very strong stalks begging to be picked. So… we did just that, and since the weather has returned to it’s regular ‘chilly’ setting with frost overnight, a simple crumble seemed just the way to use up our first spring produce! This crumble needs remarkably little sugar (making it a fairly healthy sweet treat! ), partly because the small apples were so sweet and also because I have found our spring rhubarb to be nowhere as tart as I remember rhubarb of old! I used a good quality meusli with whole almonds and big juicy californian raisins, which produces a loose crumble, but is worth it, I think! Preheat the oven to 180˚C, 350˚F or gas mark 4. Put the rhubarb and apple, mixed, into the bottom of a casserole or pie dish. Pour on the honey or maple syrup and stir briefly. 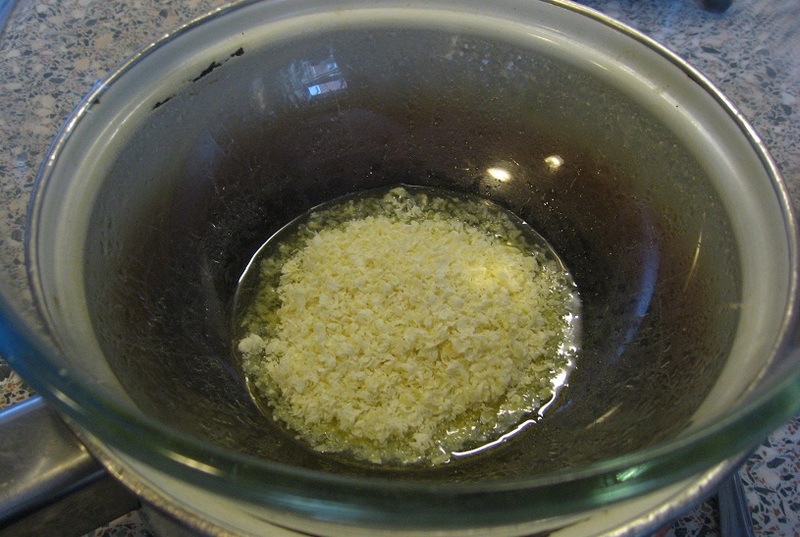 Melt the butter or margarine in saucepan. Add the meusli and oats and stir until coated in butter/margarine. Spoon over the fruit mix. Cook in the oven for about half an hour, or until all the fruit is soft. Check the crumble about half way through and if the crumble has browned, but on a lid, or cover with tin foil. A while ago I attended a raw chocolate workshop given by Tanya Alekseeva of Better Raw and I’ve been practising to get them right since then. To me the key seems to be to get the right amount of sweetener, because if you’re using agave syrup, it can overpower the chocolate. As Easter is just around the corner, maybe it’s time to give these healthy chocs a go! Grate the raw cacao butter into a bowl and place over a pan of water on a low heat and melt gently. Once melted add raw cacao powder and mix well. Ensure the heat is low and add the agave and mix well. Taste the mix once melted and add more sweetener if necessary. Once completely melted and blended remove from heat. Your mixture should be runny and easy to pour. Pour into cases or moulds and sprinkle with the cacao nibs. Leave to cool for a few hours.